In just over nine hours, ParisianPlayer defeated every boss in the game and unearthed most of its secrets while the entire time a Budweiser scarf was tied around his face. 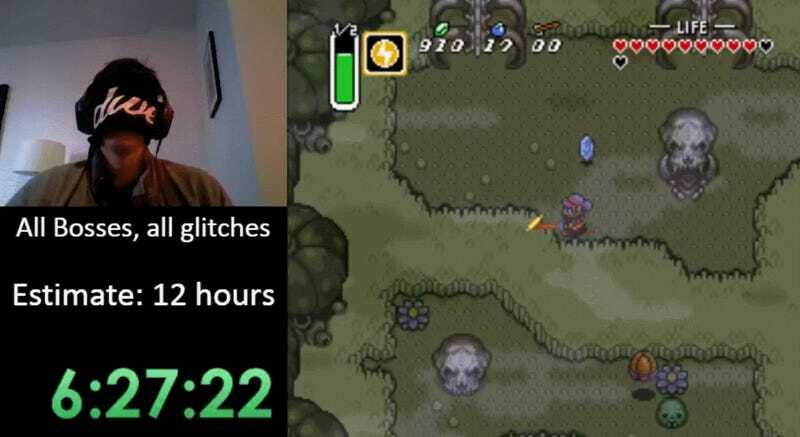 He originally thought it might take closer to twelve, but even after making a handful of mistakes, the Canadian speedrunner managed to surprise even himself. Blindfolded runs aren’t a new thing. 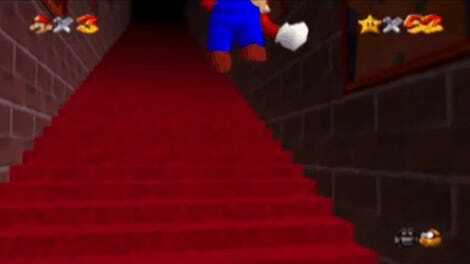 Games like the original Super Mario Bros. as well as the N64's Ocarina of Time have proven fertile ground for those players wishing to prove how good they are even while devoid of sight. So it only makes sense that, in a community driven by an obsession with pushing the boundaries of what’s possible in gaming, speedruners would branch out into other games. In ParisianPlayer’s case, that new frontier was Link to the Past. Of course, there are several different way to do a run of Link to the Past, even while blindfolded. In speedrunning there are “any%” runs where it doesn’t matter how much the player actually does in the game as long as they beat it, as well as “no major glitch” runs that require the player to complete the game without executing any major exploits that would help them jump to later parts or gain access to power-ups earlier than normal. So ParisianPlayer had to decide on a goal that would push the envelope but still seem achievable. “Some people did the ‘true any%’ blindfolded but it is very easy and requires probably 5-10 mins,” he said. 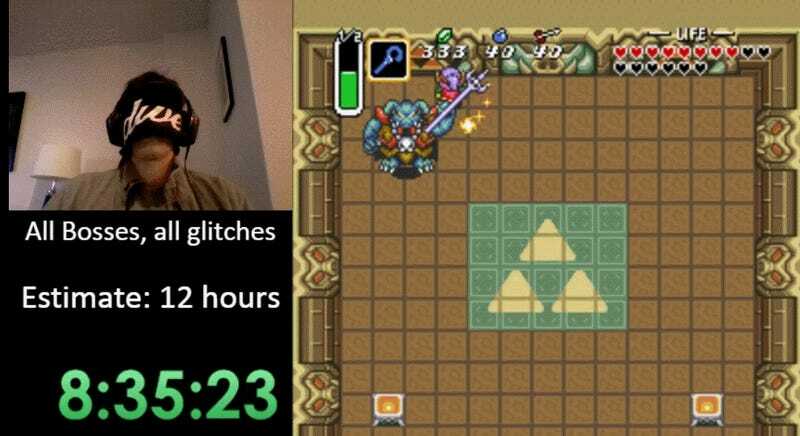 “‘True any%’ was not enough for a real challenge and the main category, any% no major glitches, is too hard (and I consider it impossible) so I went for the hardest feasible category I could imagine and it was this one (All bosses, all glitches).” This makes ParisianPlayer’s nine hour blindfold run from yesterday the first of its kind. The keys to succeeding are two fold: using Link’s sword and bombs as sonar devices to help the player orient themselves and making sure to take advantage of the game’s most notorious glitches. The first is straightforward in theory but still difficult in practice. 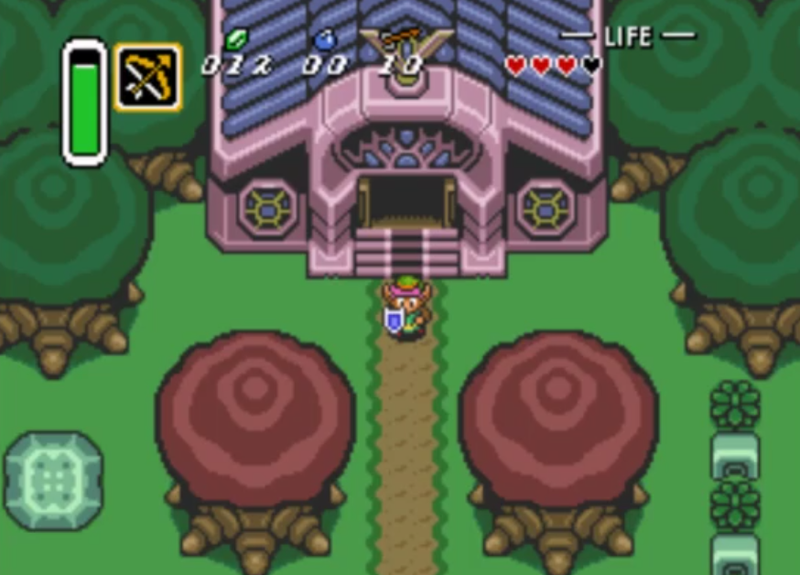 Link to the Past allows the player to hold out Link’s sword so that it can both clink against walls and obstacles as well as defend him from enemy attacks. In the end it requires learning to visualize and play the game in a completely different way, thinking in terms of sounds rather than pixels. As for the glitches, since ParisianPlayer was promising to defeat every boss, he could only use them as a means to getting stronger equipment earlier and not as a way of bypassing the game altogether. “I mainly use the exploration glitch (EG), which is a very well known glitch,” he said. “It allowed me to enter some dungeons early in order to finish them or to grab the items in them.” The “Go Anywhere” glitch, as it’s also known, lets player travel to any part of the game’s map if they save and quit the game right after jumping off a ledge into a pit. It’s a crucial exploit because some of the game’s bosses are much harder than others, and being able to traverse the game out of order makes the blindfolded run more feasible. “I needed it to skip temporarily the Tower of Hera because the boss there (Moldorm) is (almost) impossible with so few equipment,” said ParisianPlayer. After strategizing with these tactics in place for a month, and then practicing for two more, he finally felt ready. In this regard, the blindfolded speedrun is not just a mental challenge, but also a physiological one. Yesterday, ParisianPlayer sat in the same chair for nearly ten hours with only the sounds of a 25-year old SNES game to keep him company. Occasionally someone from the Blindfolded Brotherhood would check in over the voice app Discord to let ParisianPlayer know the status of the Twitch chat, but for the most part he was alone with the game and the challenge he’d set out for himself, never 100% sure where he was in the game, or what he was clicking on in a menu, or even what time it was. Early in the run, while making his way up toward the Tower of Hera, the game’s third dungeon on the northern most part of its map, there’s a cliff with enemies and falling boulders scattered across it. “So here you press diagonal and pray,” ParisianPlayer says to no one in particular. Several hours later, his faith pays off. You can re-watch the entire run here.